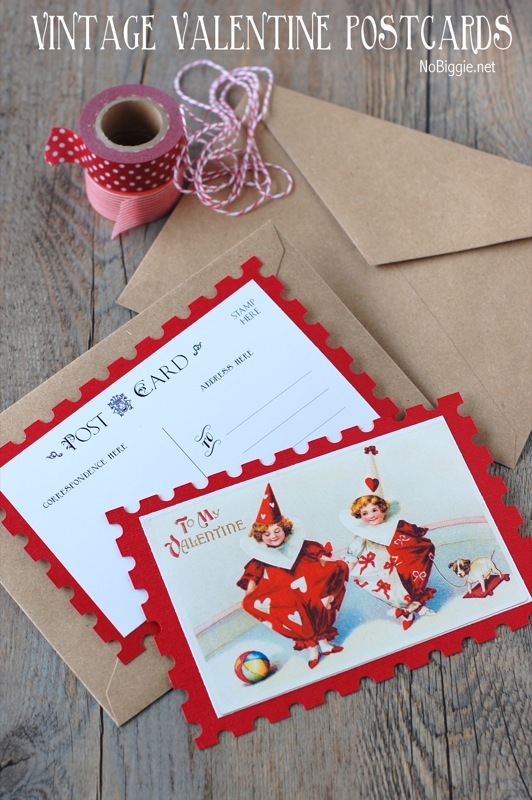 Vintage Valentine postcard printables…a free download. I’m so happy to share this vintage Valentine with you today! The artwork is by Ellen Clapsaddle and it’s just the sweetest. I fell in love with these adorable little Valentine clown girl images and I was searching all over for them. I was thrilled to find them on The Graphics Fairy. I met Karen The Graphics Fairy last April at Snap (the blog conference) I love her site and all she shares. 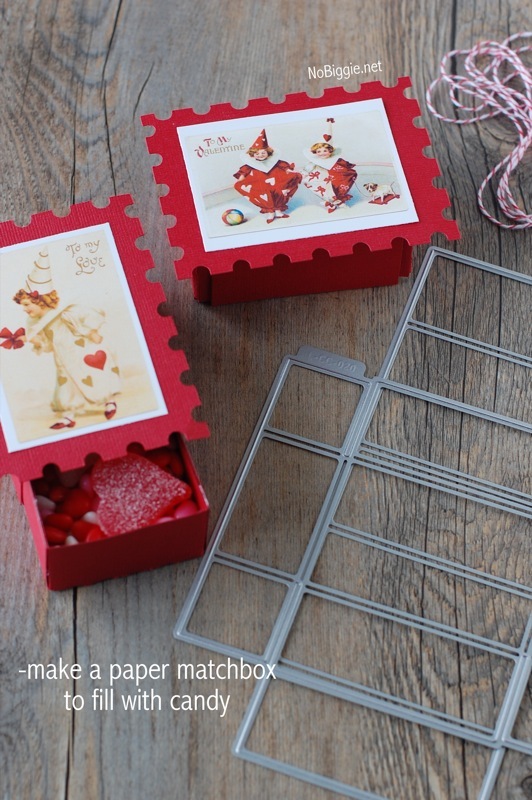 To make these sweet little matchboxes, I used this matchbox die from Lifestyle Crafts. I first printed off the images and cut them apart. Then I mounted them on red card stock. You can just mount them on red card stock with a simple edge or you can download this simple postage stamp edge that we created to be cut out with your Silhouette machine, Cricut or any other type of digital cutter (link for download below). 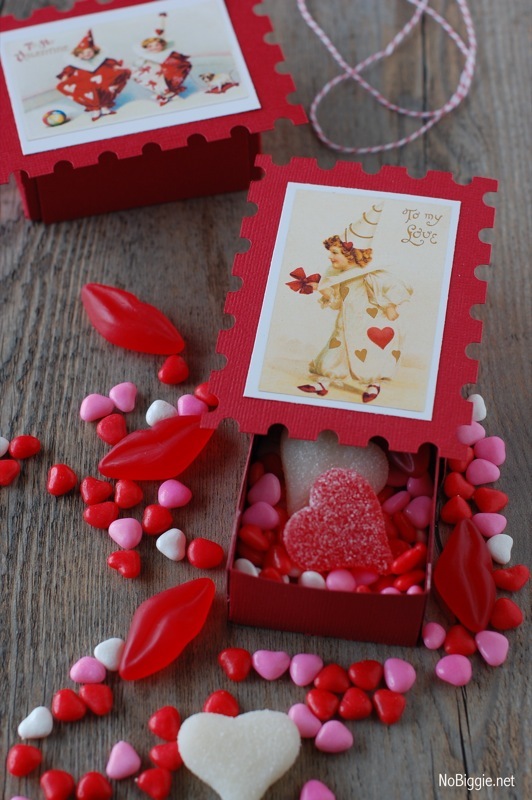 Once you’ve got the box assembled, you can glue the postage stamp edge to the top, then just fill with candy and deliver to someone sweet. We have also created a larger size to be used as a postcard. Just print it out and mount the front and the back of the postcard to both sides of the red card stock. Again, you can mount them on card stock with a straight edge or you can use the postage stamp edge cards we created using your digital cutting machine. 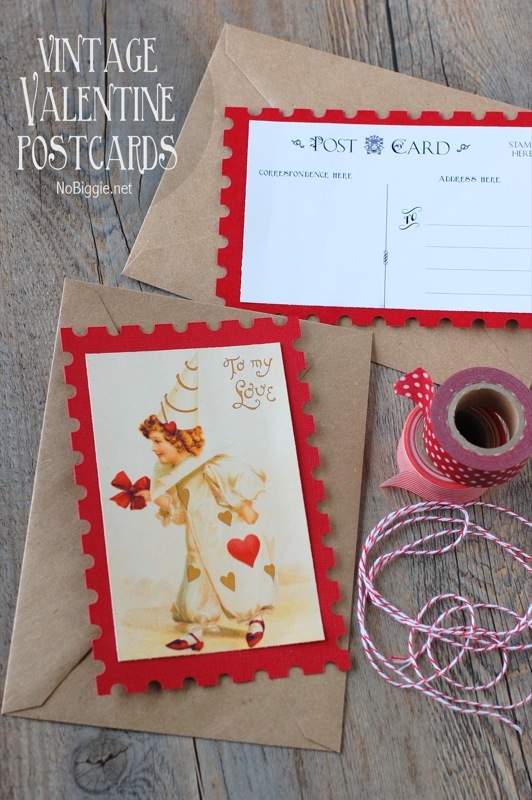 Just write something sweet and drop in the mail for good old fashioned fun mail. Here’s a tip…with this type of postcard, it’s better to mail it inside an envelope to ensure that it’s received looking nice rather than mail it like an actual postcard. Learn from my mistakes, envelopes are a good thing. Aren’t they so sweet? They would make someone’s day, I just know it! Printables from NoBiggie are for PERSONAL USE ONLY. Regardless of what type of digital cutting machine you use, one of these file types should work. I absolutely love vintage things! I can’t wait to make one for myself. Thanks for the inspiration! So Cute! Found this on pinterest and re-pinned! Great craft idea!! Just too cute and I have that die….!!!! Did you print the Valentine’s on to Card Stock or Photo Paper..??? The picture quality is beautiful….!!! Thank you! The valentines were printed onto photo paper.